Wow, I had an experience like no other last night. 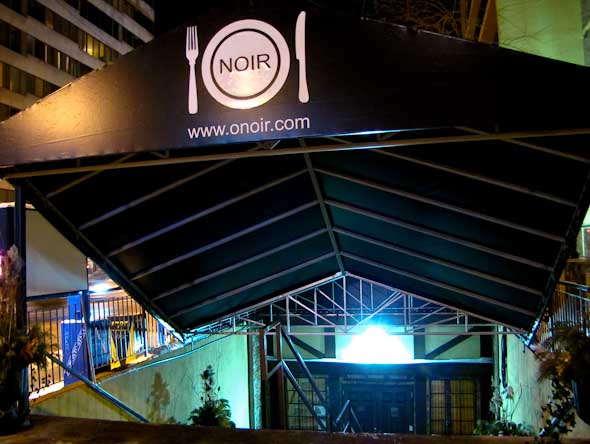 I am now aware what it is like to be blind after spending to two hours of “dining in the dark” at O.Noir in Toronto Ontario. Last week, I was invited to a 40th birthday party for my very dear friend. I was informed that it would be a night on the town in Toronto. Our first stop would be O.Noir on Church Street. Well, if you know me, I do not research or ask questions. I simply go. Upon our arrival, one of the attendees looked ridiculously nervous and stated that he didn’t know if he could spend two hours in the dark. I was like WTF????? I’m going to be eating in the dark? Yes, we were escorted into the dining area (after giving my order) by our blind waiter Victor. I held on to his left shoulder (he held my drink), and hubby held on to mine and so on and so on. Victor stopped abruptly, took my hand and led to me to the back of the chair. I felt around a little more and sat down. WTF? I can’t see a thing nor will it be possible to even assume that my eyes would adjust. The noise, the smell of the food, and my inability to socialize was escalated a hundred times more than normal. The whole experience made me feel so alone despite having 94 other people in the same room as myself. Once dinner arrived, I realized that my fork would not meet food successfully. So, I decided to eat my supper with my fingers hoping to hell that there wasn’t cameras filming the crowd. I wasn’t surprised to hear that everyone did the same as myself. After dinner, I declared that I was done with this experience and that I was leaving to enjoy a drink in the lobby. Most of my party agreed and followed me to the exit with Victor’s assistance. As I was leaving, I noticed that most of my risotto had fallen down my blouse (Thank God I wore black). I have a new appreciation for the visually impaired. It was a very different experience which I recommend. The food was amazing! I wouldn’t attempt to eat the surprise dish that is offered in every course of the meal. I don’t think I want blindness to meet mystery. O.Noir supports the visually impaired community by training them to work for their establishment. As well, a portion of your bill is donated to associations related to the blind and visually impaired. So if you’re up for the true “blind” date experience, try O.Noir. It’s something that one can only imagine til you try it out yourself.